Pics and Kicks: Who's the boss? When I was a kid and I was just downright frustrated or angry or sad, my parents would often say "who makes Natalie sad when Natalie's sad?" I would be FURIOUS. "Clearly I am sad because YOU, who call yourselves my PARENTS, and SAY that you LOVE ME, won't buy me that pink Koosh ball!" (For those of you who don't remember koosh love, I'm just plain sad for you). Well, The fury has died down and I'm so thankful to my parents for teaching me ownership and control. Some humans on our planet have a tendency to spend a LOT of time feeling victimized and thus take no ownership for the state of their lives (or the feelings they're harboring). They ALLOW themselves to be ruled from the outside in, rather than from the inside out. They ALLOW someone else to be the boss of them. Well, the other day I was reading my dear old friend Lindsay's blog and I came across this great quote from her dad (who I also know and love). Anyway, so I'm reading her beautiful blog, minding my own ruddy business and wack!, suddenly I was in tears. It is so wonderful; it just HAD to be shared! "Sometimes, you gotta tell your feelings how to feel! 'Feelings, I feel gooooood today!'" I have been in such a funk the last couple of weeks. I know that I'm just moving in and out of the stages of grief and that everything I have been feeling since Gavin bit the dust (trust me he'd think that my total lack of propriety was hilarious) is natural and to be expected. I'd also be the first to tell you NOT to be too hard on yourself for feeling down and out. I know an awful lot about depression (it runs in my family), and I suffered a pretty intense postpartum bout after Raleigh. I also know that sometimes we just let ourselves sink, sink, sink, deeper and deeper feeling ENTITLED to our grief and terrible pain--maybe even feeling defined by it. Then suddenly we're drowning crying helplessly "why me, why me, WHY MEEEEEE?!?!?!?" So the key to that quote is the "SOMETIMES." Sometimes it's good to yell and scream, kick and punch, sometimes you've just gotta cry until the pressure in your eyes seriously threatens to fling from their sockets at any moment, sometimes you've just gotta let go, AND SOMETIMES you've gotta take the bull by the horns, the horse by the reins, the boots by the straps, the pig by the tail (yes, I made that last one up) and just move forward. 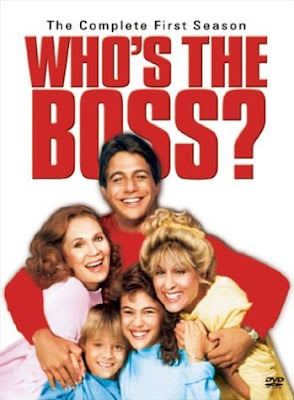 After all, who's the boss around here anyway? PS- I thought Tony Danza = hot babe when I was a kid, "not." Ha ha ha! Child of the eighties? Cue hardy laugh. Love it. Love love love it. I wish I had all the right words to say at all the right times. Sometimes I feel pretty worthless to you (with Gavin "biting the dust"...yikes), and it just makes my heart so very happy, when I hear that you have heard (or read) things that "tell your feelings to be happy"!